Puerto Rican education advocate Leticia Egea-Hinton is an integral part of the School District’s historic transition to local control. The future of Philadelphia’s School District begins, in part at least, a few decades back and about 100 miles north, with a little girl growing up in Brooklyn. Her parents, both from Puerto Rico, didn’t have much money and hadn’t had the opportunity to go to college. She was raised with the traditional expectation for girls to grow up, stay at home, and raise children. But Leti, as she was called, had big dreams, and began to see herself as a leader – someone who could make an impact on many other children and communities. Someone who could forge not just her own way to success, but widen that path for countless others. 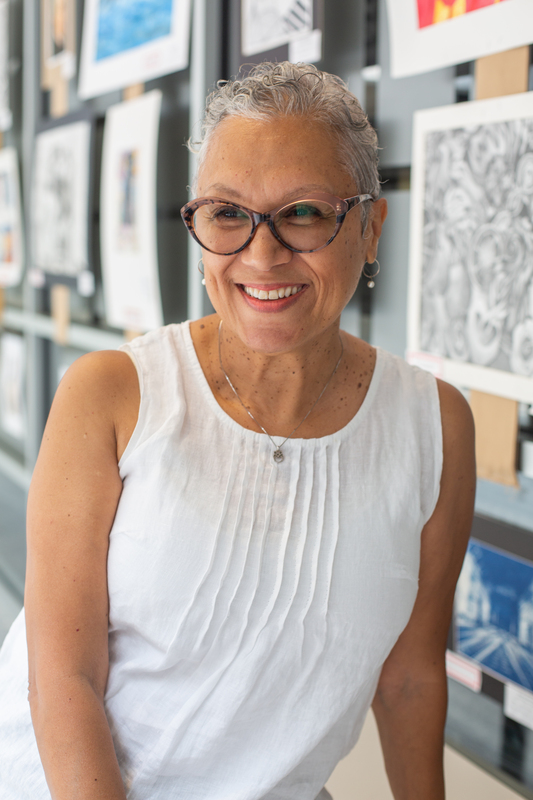 There were people along the way who told her she couldn’t do it - that she wasn’t “college material.” But Leticia Egea-Hinton, still called “Leti” by her friends, family, and the many people who have worked with her throughout Philadelphia, went on to college and beyond. She got her bachelor’s degree from Chestnut Hill College, a degree in public administration from Antioch University, and then her master’s degree in social work from the University of Pennsylvania. 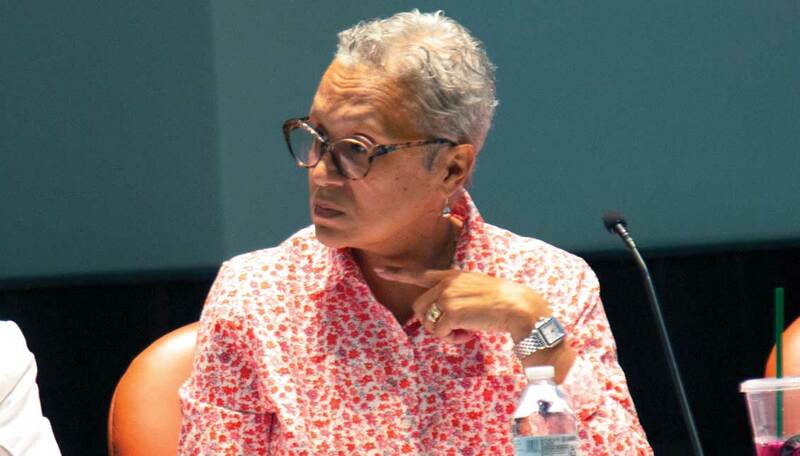 “I’m the kind of person, if you tell me I can’t do something, I’m going to do it,” said Egea-Hinton, peering matter-of-factly over her glasses as she sat in the bright new office for the Board of Education members at the School District of Philadelphia’s central building on Broad Street. Her no-nonsense but compassionate approach characterizes the way she embraces her role as an educator, a parent and grandparent, and, most recently, one of the nine representatives for the city’s new Board of Education, which as of July 1 has officially taken the reins from the School Reform Commission (SRC) and assumed local control of the School District for the first time in almost 17 years. The responsibilities of the job can’t be understated — creating an entire new board in a position that is unpaid and often without a whole lot of thanks or praise from a public that is, naturally, often divided on what the most pressing educational issues of the city are and how the School District can better fulfill those needs. But Egea-Hinton said that her motivation to step into the role comes from the same place that drove her as a young girl to seek out and develop opportunities to practice her own leadership. “I’ve recognized realistically the good the bad and the ugly. And understood that sometimes people are going to love me, and sometimes people are going to hate me, but my focus has to be on what the mission is, and ultimately it’s about serving children,” said Egea-Hinton. And for Egea-Hinton, the challenge of this job is in the context of the enormity of the struggles that she has faced and seen others face throughout her life and work. From personal experience, and as an educator, as well as as a nonprofit and government manager, Egea-Hinton knows firsthand some of the challenges that life and poverty can throw at people, and the doors that education can open to lead the way out of those tougher situations. “I’m really supportive of education as a stepping stone, as a door that opens up possibilities that sometimes people don’t think about,” said Egea-Hinton, noting that even though her parents didn’t go to college, she was able to thanks to her own educational preparation, and sees that as an option that all children should be able to consider. Egea-Hinton said that she and her other board members are “honored” to be a part of what is an unprecedented moment in the School District’s history. The SRC, consisting of five members appointed by the state of Pennsylvania, has been in control for the past 16 plus years, and the new board representatives have been charged with the task of redefining what local control and a more transparent governance will look like. Since they were appointed to the position by Mayor Jim Kenney on April 4 after an extended nomination process, the board members have thrown themselves into the job by participating in a round of listening sessions organized in various neighborhoods throughout the city as well as attending other orientation and information sessions to learn the specifics of School District. The listening sessions that board members completed in different communities throughout the city were particularly informative, said Egea-Hinton. “I learned that you have a lot of people in the community that are really passionate and interested about their children’s education. And there are those who are interested on an individual [level] but then there were those that are more interested on a community level, in something a lot longer,” said Egea-Hinton. Some of the themes that Egea-Hinton took away from the listening sessions were equity and transparency. Egea-Hinton said that young professionals whose children are just about to start school were particularly concerned with equity so that they would not feel forced to leave their neighborhoods and move so that their children would have access to better schools. While transparency was also a top priority for a lot of people, Egea-Hinton observed that “depending on the community, transparency meant something different,” as some people are more concerned about transparency with the budget and others more interested in having transparency with programmatic decisions. Egea-Hinton said that as a School District parent, she herself experienced a lack of transparency in the decision-making process. “Sometimes as a parent I didn’t really understand all the nuances, or what the reasoning was behind decisions that were made that might have affected my community, or my children...because I wasn’t a part of that process,” Egea-Hinton said. Of Egea-Hinton’s three daughters, one of them went to a charter school, and one went to public school at the Philadelphia High School for Girls. For Egea-Hinton, that will to listen and seek out other’s voices is key in decision-making processes. As a longtime city government leader who has worked with Philadelphians experiencing homelessness, Egea-Hinton brings a deep knowledge of the most vulnerable populations here, and the kinds of needs that are present in a city with nearly 26 percent of the population living in poverty. Her work with the homeless population in the city - including her time serving as assistant manager of the city’s Office of Supportive Housing and director of the Office of Emergency Shelter and Services - has given her an acute awareness of the ways in which poverty affects many people and populations throughout Philadelphia, as well as how to meet diverse and urgent needs when working with a very limited budget. “When I look at it I don’t look at it as specific groups of people, ethnically, because the thing that ties many of the populations together is poverty,” she said. That thread of poverty is one that was woven through Egea-Hinton’s own life. She became the first in her family to get a high school diploma, and suffered from discrimination because of her race and class when she later moved to Philadelphia and attended Hallahan High School, an all-girls Catholic high school, for four years. But Egea-Hinton is nothing if not optimistic in the face of obstacles — even her hobbies, like spinning and knitting, involve a challenging element that she seems to relish. And for every personal or public dilemma she mentions, she can find not so much a silver lining as another thread, equally strong, to grab onto and tug on to pull herself and those around her ever forward. In the case of high school, that lifeline of encouragement came in the form of her mentor, Father John Donahue, who encouraged her and the other students to think about college. Egea-Hinton didn’t even see herself as college-ready, she said, but that sparked a desire to pursue that dream of college and look beyond the secretary positions that she said she and other children of color were educated to do. “You don’t always have the opportunities that maybe some other people do that live in other neighborhoods, or maybe better schools. So I get it from that perspective,” she noted. It is her family, said Egea-Hinton, who has provided her with a complete network of support throughout her career, and will continue to do so as she takes on this most recent leadership role. She lights up when she talks about her husband, whom she’s been married to for 34 years, and sisters and cousins, or when she holds her 10-month-old grandson, Liam, who will have to start going to daycare a couple of days a week due to his retired grandmother’s increasingly busy schedule. “It’s been interesting because you don’t want to lose yourself, and when I say lose myself, I can’t leave my family behind,” she said. “It’s a balancing act,” said Egea-Hinton, poised to tackle yet another challenge with grace and determination.